The town of Amboy is just four miles east of Red Cloud on Highway 136. The post office was started in the name of Webster Center on March 7, 1879, due to its closeness to the center of th county at the time. The name was changed to Amboy on December 23, 1879. It was maos likely named for Amboy, Illinois. The post office was discontinued on January 8, 1890. Some of the remains include a schoolhouse, a mill, depot/warehouse and a barn. At one time Angus boasted a population of about 600 to 700. It is located just a few miles notheast of Nelson, Nebraska. On October 30, 1873, a post office was issued in the name of Ox Bow. This was most likely due to the large U-sahped bend in the river, where only a neck of land remained between the channels. There was a flour mill here. The name was changed to Angus on December 6, 1886. The post office was discontinued in 1977. Angus also had a bank, a hotel, lumberyard, livry stable, three general stores, a depot, two churches, a hardware store. It was just a couple miles from the famous Oregon Trail. It even had the first concrete swimming in the county. It was built in the 1920's, but is now filled in out in the middle of a pasture. The was also a train that came through Angus. The train depot was finally closed in 1942. The tracks were pulled up in the 1980's. The foster father to Calamity Jane also lived here in the late 1800's. Before the town of Angus was officially dead, it made the headlines a few times recently. In 1983, someone released two African lion cubs in the area. They were eventually captured one mile west of Angus. Angus is also the home of the largest fossil discovery of a mastadon in the U.S. It was over 14 feet high. It is now in a museum in Denver. Today, all that remains in Angus are four houses and a store and repair shop. All other buildings have already fallen down. Belmont is located in the panhanle of western Nebraska in Dawes County. It is a remote town. It was named for a railroad official from Lincoln. The post office opened on November 9, 1889. A railroad tunnel was built here from 1888-1890. And it was widened in the 1920's. The tunnel is 750 feet long. Belmont used to be a passenger stop on the railroad on the way to the Black Hills. The post office closed in 1957, as most of the residents were now gone. There are still a couple of buildings, a school and a railroad tunnel there. The tracks are still used, so watch out for trains! To get to Belmont, take Highway 2 west out of Hemingford for 12 miles. Turn north (right) on Highway 2-71 and go 18 miles to the Belmont sign. Drive three miles east on a rough dirt road. Turn left right before the bridge and go over the railraod tracks. The town is right before you. Brazile Mills is located in northeast Nebraska just three miles north of Creighton. The town was built on Brazile Creek. Two mills were built here, a grist mill and the state's first woolen mill. The post office was established on January 10, 1879. It was finally discontinued in 1951. In 1900, it hit its peak population of 175. There are still a few original buildings here. Burton is located in northern Nebraska in Keya Paha County. It is on Highway 12 just 5 miles north and 9 miles east of Springview. 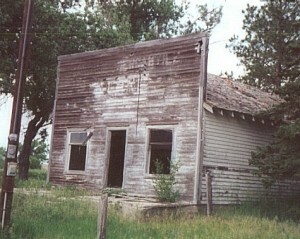 The post office opened for business on June 5, 1884, but closed in 1893. there are still some abandoned buildings here. Crookston is located in northern Nebraska in Cherry County. It is just 11 miles west of Valentine on Highway 20. The post office opened on December 12, 1886. the town was named for the yardmaster, W.T. Crook, of the Chicago and North Western Railroad. It had a peak population of 373 in 1930. According to the 2000 census there are still 98 people residing in the area, but it is pretty much a ghost town by many standards. 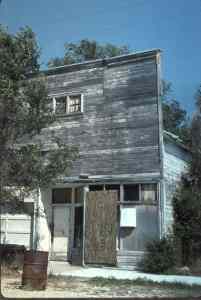 Many abandoned buildings and store front are still on the main street. Dannevirke was started by a group of Danish settlers in 1874. It is located in central Nebraska just a little northwest of Elba, Nebraska. If visiting ghost towns in the area, check out Nysted (on another Nebraska ghost town page), which is only a few miles away. The town was named in memory of a wall built by the Danes to stop German aggression. The post office opened on February 16, 1880. It operated until December 21, 1903. There are a few good remaining structures here. 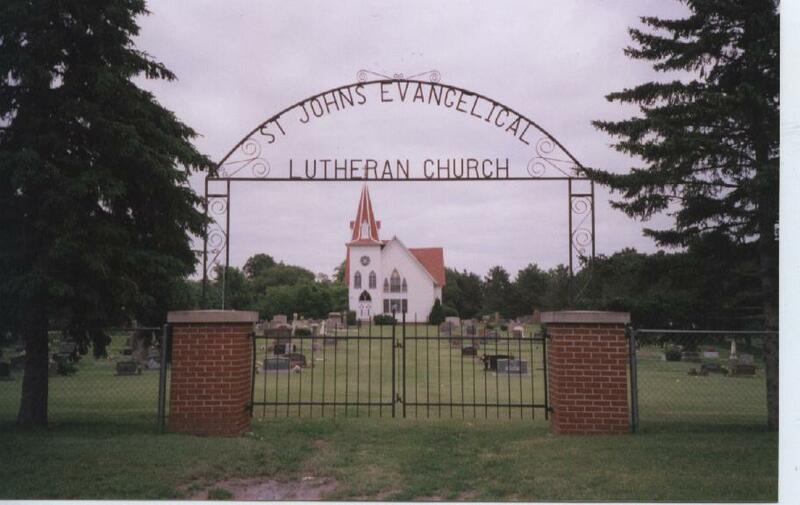 They include a church built in 1906 that is on the Nebraska register of historic palces. Also remaining is a community hall built in 1901. Dunlap is located in the western part of Nebraska in the panhandle. It is a very remote area. This is the exact area for the setting of Stephen King's Children of the Corn. And it feels very lonely and desolate. The post office was established on February 11, 1888, with Edward Roberts as the first postmaster. The town was named by Roberts for the officer he served under in the Civil War, Brigadier General James Dunlap. The town had a flour and feed mill along the Niobrara River. It also had a skimming station for milk and a cheese factory. Dunlap used to be a popular stop between Alliance and Chadron. The fourth of July promised rodoes, fireworks and political speakers. The town slowly fizzled out and the post office closed in 1935. A couple of buildings are still standing including the Dunlap Mercantile. The flour mill has fallen down, but the debris is still thre marking its spot. To get to Dunlap, you should start in Hemingford. Drive 5 miles east to Highway 385. Take a left and head north on Highway 385. Go about 9 miles to Lemke Road. Take a right and head east until you see the first well used road heading south (right). The town will be on the left. Kronborg has never had a post office, mail has always been served from nearby Marquette. At the intersection where Kronborg sits, there is a big stone and wrought iron sign reading, "Kronborg Korner." This sign has probably been here for over 100 years. There is also an old schoolhouse, a few old buildings, a spooky old two story house, an really eerie old church in the middle of an old pioneer graveyard (1800's) with some real big headstones. This is a REALLY spooky place at night. Marsland is located on Highway 2-71 in the panhandle of Nebraska. It is a few miles southwest of Belmont. It was named for Thomas Marsland, a frieght agent on the CB&Q Railraod. A church, railroad depot and a post office were among the first building built in Marsland. The post office opened on September 12, 1889 and a school opened in 1890. At one time Marsland had 800 people. The most common professions in the area were ranchers and potatoe farmers. Cattle were driven into town to be loaded up and shipped by rail. There was also an ice harvesting business on the Niobrara River. Blocks of ice were stored in an icehouse and used to refridgerate boxcars. Marsland withstood many natural disasters. Grasshopper plagues, droughts and four major fires (1911, 1913, 1914, & 1928), swept through the town. The Great Depression closed the bank and the potatoe crop failed around this time. People gradually moved out and the passenger train ceased to stop here anymore. Today, the post office is the only business in operation in this tiny community of 9. Minersville was named for the coal deposits and mines in the bluffs overlooking the Missouri River. It is located in Otoe County in eastern central Nebraska about six miles south of Nebraska City. The town was first called Bennett's Ferry, due to a man named John Bennett, who operated a ferry across the Missouri River to Iowa. The post office in Bennett's Ferry opened on January 28, 1856. The name was changed to Otoe City on April 20, 1857. The name was changed again to Minersville on December 21, 1874. At one time there was over 1,000 people living in Minersville. In 1901, a shaft cave in at the coal mines killed all but 14 men and boys working at the mine. The post office operated until February 15, 1923. The downtown area is still there, but is really run down. Located 2.8 miles northeast of Cedar Bluffs, this "town" was originally designated to be the state capital of Nebraska. The site was proposed, platted, and talked about, but not much actually happened. During the 1850s and 1860s a few log structures were built. Later when the Union Pacific Railroad was built, the site of Neapolis became a major construction camp. But, when the railroad moved on, the site was abandoned. Nysted was named for a town in Denmark, where most of the residents had once lived. The surrounding area is high in danish culture and ethnicity. The post office for Nysted was established on April 12, 1883. By 1890, it had already hit is peak population of 65. The post office was discontinued on September 30, 1918. Mail is now served from nearby Dannebrog, "The Danish Capital of Nebraska." The gravel roads and cornfields haven't changed much in the last 100 years. There are a few old brick buildings still standing in Nysted. There may be a nearby cemetary and other remnants. 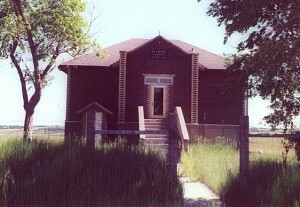 Oak Grove Station is located just two miles southeast of present day Oak, Nebraska. It was stop #7 on the Pony Express Trail in the 1860's. The most famous event that happened here was an attack by the Souix Indians in 1864, that killed many people. Oak Grove Station is very near the ghost town of Angus (above). It is located on the Little Blue River along the Oregon Trail. The town originated on the south side of the river when the Pony Express station was set up there. Later a mill was built on the other side of the river. The town moved across the river to be closer to the mill where many people worked. A few years later the railroad came through about two miles to the northwest. The town again moved and shortened its name to Oak, which is still in existience. Today, only two houses and a graveyard remain close to where the mill used to stand. There is also a historical marker here denoting the Oregon Trail's location. Spring Ranch was most likely named for the numerous springs in the area. The post office was established on December 14, 1870, and discontinued in 1940. Spring Ranch hit its paek population in 1910 at 57 people. Spring Ranch was a stagecoach stop on the Overland Trail, it was on the Oregon Trail, and it was Pony Express stop #9 in Nebraska. It was on the north side of the Little Blue River. It also was a farming and ranching town. Some buildings, mostly parts of building still stand. There are markers noting where other important buildings once stood. I believe an old train depot, or at least the brick parts of it still stands back in some trees. On the highway (Highway 74) directly north of the townsite, there is a historical marker with the story of Spring Ranch on it. BRIDGEPORT...This was the site of a ferry that transported folks to Cedar Island, an island in the Platte River, several miles upstream (west) of its confluence with the Missouri River. It was located in what is now tangled trees and undergrowth west of the resort, three miles west of the US 73/75 bridge over the Platte River at La Platte. CHALCO...This is an old 1880s railroad town that developed northwest of Papillion. The site is just to the west of State Highway 60, and just south of the county line. All that remained in 1993 were a grain elevator and warehouse, both of which are still in use. DYSON HOLLOW LIME KILN...During the 1850s, the lime-kiln at this site employed about 400 men. Huge quantities of lime was mined and milled here. During the 1930s extensive ruins remained, and even today if you look carefully through the underbrush along Dyson Hollow Rd, south of Platteview road, you can still see some ruins. FOREST CITY...The barren site of Forest City sits a mile and a half west of Gretna, in the far west end of the county. The town was originally founded by Irish immigrants, and a town rapidly built up after their arrival. On April 18, 1858, Forest City incorporated. For twenty years. the little community was large on spirit, even contributing its brass band to county functions and parades. It was along the road from Omaha to Ashland, and along the stage line. It had a post office, catholic church, two stores, two boarding houses, a granary, and a school that was held wherever room could be found to hold classes. By 1875 the town was eclipsed by nearby Gretna, and the population migrated to the new location, which was located on the Burlington Northern Railroad. FORT CROOK CITY/FORT CROOK...Located south of the riverboat town of Bellevue, Fort Crook was built between 1894 & 1896, with the first infantry troops moving in on June 28, 1896. It wasn't until 1918 with the arrival of the 61st Balloon Company, that it became an airfield. Majestic brick structures marked the fort's buildings, and it became a very important post. In 1921 dirt landing strips were graded, and by 1924, the landing field had become known as Offutt Field. Both the airstrip and army post grew in importance, until June 11, 1946, when Fort Crook officially transferred to the 2nd Air Force. On Jan. 13, 1948, it became Offutt Air Force Base. Fort Crook City was located just outside the west gate of Fort Crook, and served as a "support" town for the soldiers stationed there. The main street was a long line of one and two story wooden structures that housed diversions such as saloons, saloons, and saloons. Today the site has been absorbed by Bellevue, and most lies under the pavement of US 73/75. GILMORE...This is a "wannabee" town that barely established itself. Its site is where the Union Pacific Railroad crosses 36th Street. A grain elevator, stock pens, and a railroad depot that contained the post office marked the community. Today it is a barren site. La PLATTE...two sites...The first site of La Platte was along the Missouri River, just north of the Platte. It was established by four men around 1855. A year later, the site was abandoned mainly due to flooding. Nothing marks site #1. The town moved inland a couple miles, and was reestablished under the name of Larimer Mills (see). 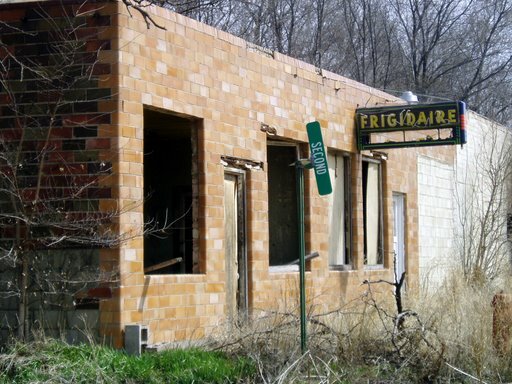 In the 1880s when the Missouri Pacific Railroad pushed through the area, the town of Larimer had faded. A railroad station called La Platte was established on the north side of the tracks, across from what was Larimer. Today site #2 is a small, sleepy community with a population of several hundred. There are a number of OLD buildings in town. LARIMER CITY...After the town of La Platte relocated to the inland site, it grew slowly. It was at first called Larimer City, but that was changed to Larimer Mills. In 1859 advertisements were run in various newspapers for the two-story whitewashed wooden Larimer Hotel, which still stands. 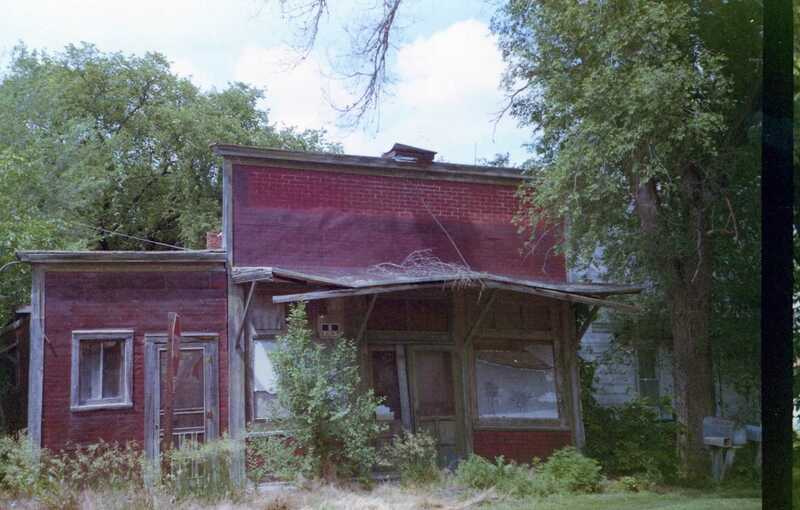 It is a private residence, and sits just south of the railroad tracks on the south side of La Platte #2. The rest of Larimer is overgrown with trees, or lies under La Platte #2. MEADOW...Nothing much remains of this once busy railroad junction community but scattered farm houses, cornfields and rubble. A mile and a half west of town is the Meadow Cemetery. PORTAL...This small railroad town was predated by a one-room school and cemetery; both of which remain. The site of the town is long gone. It was located along the Union Pacific Railroad, northwest of Papillion, on Giles Road, between 108th and 114th Streets. SARPY CENTER...This is the number one ghost town SITE in the county, and today is just about gone. The old school and a store still remain, but both have been converted to farm homes. The town was founded in 1874 by a Captain Spearman, with the anticipation of the arrival of railroads, and county seat honors. With its location in the center of the county, both seemed assured. The Chicago, Rock Island and Pacific Railroad did come through, and an election was held for county seat. Three towns became finalists...Bellevue, Papillion, and Sarpy Center. Bellevue was eliminated in a second election, and the folks of Sarpy Center were jubilant. Sarpy Center as a town was busy and consisted of a blacksmith, hotel, store, school, and newspaper...Sarpy County Sentinel. In April 1875, a third election was held, and Papillion took the county seat honors. This proved too much for Sarpy Center. Most folks moved southwest to Springfield, and Sarpy Center became a ghost town. Its site is at the corner of Fairview Road and 120th Street. XENIA...Located seven miles east of Springfield, the town site is at the corner of Buffalo Road and 192nd Street. On the northeast corner the abandoned schoolhouse sits with empty window sockets staring into the green corn fields. On the southwest corner the old store has been converted to a home, and is occupied. A half-mile to the west is the old cemetery.